Automatic External Defibrillators (AED) are proven to increase the rate of survival of individuals who experience sudden cardiac arrest. 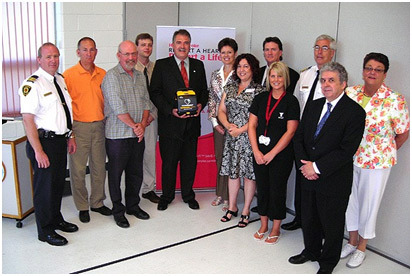 Local businesses and organizations are now making AED's readily available in public places for a rapid response to any sudden cardiac arrest as part of their Health and Safety responsibilities. What is an Automatic External Defibrillator? Traditionally, defibrillators were found in hospitals and ambulances; however, due to the importance of early defibrillation in sudden cardiac arrests, automatic external defibrillator machines (AED) have been developed for use by the general public. An AED is able to read the heart rhythm and will treat life threatening cardiac arrhythmias through a shock (defibrillation) allowing the heart to reestablish an effective rhythm. 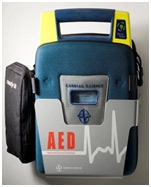 AED's are designed to be used by those trained in CPR. Good Samaritan Laws in addition to the Chase McEachern Act (Heart Defibrillator Civil Liability) 2007, protects individuals from liabilty for damages that might occur from use of an AED at the scene of an emergency. 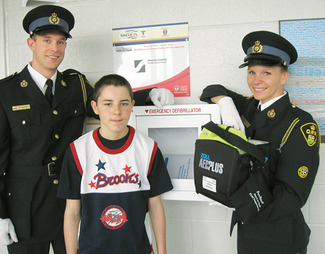 of the school, his life was saved by the use of an on-site AED. For more information or to arrange an interview, please visit our [ contact ] section for communications by email or telephone.